Smart Jewel ERP – India's best diamond jewellery software solution for jewellery industry. 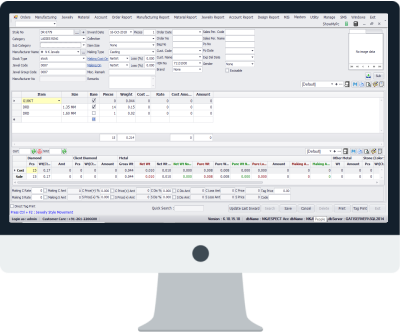 The Smart Jewel ERP is a diamond jewellery software to Manage information regarding Manufacturing, Order, Sales Management, Stock Inventory, and Account Management of Diamond Jewelry Business. The software having the power to mange the information regarding Manufacturing order, Sales, Management, Stock Inventory, Account Management. SJE Upload Clients module help clients by giving them power to upload the dynamic contents through out there own Apps and Websites so that they can have all the stocks of content deliver to their Websites and Apps. Client can monitor his Account online. Owners can monitor sales, purchase & inventory Graphically. Well designed dashboard to understand process on an ease. Responsive design to fit on your mobile , ipad and PC. Multiple users access with limited rights. Monthly, Weekly, Daily sales comparison graph on dashboard. Jewelry Manufacture by Multiple Department. Department / Worker wise Loss and Recovery. Department / Worker wise Production. Department wise issue and loss tolerance. Bag & Material acknowledge System. Multiple Manufacturer with department can be maintained. Partially out sourcing and partially in house Item Manufacturing. A Jewelry can be Manufactured by any Single Manufacturer. Give Wastage and Labour to the Manufacturer as Per decided Terms. Repairing features for the Customer Items and Our Stock Items. A Jewelry can be Manufactured by Multiple Manufacturers. move from one manufacturer to another manufacturer. Not been with Gatisofttech for very long, I have confidence their hard work and ERP solution for jewellery. We are able to manage offices in 4 different locations in the world only because of Gati. It cannot get better than them to manage clients difficulties faced due to lack of technology in our industry. They have a perfect approach to anything and everything needed to grow our business in a strategic way. Goodluck !!!! Gatisofttech is the BEST solution for jewelry industry. Nothing much to say but your software & services speak for itself. We are very happy and satisfied with your product it is easy to use and we get a good response in need from you. Please keep up this good work. It is always a pleasant experience work with Gatisofttech. The products are very nice and helpful. They customer care is also very quick and responsive. They have a very nice Product of SJE, the products are actually what we are looking for. Complete Technical Operations of Manufacturing, Inventory and Finished Goods Management of our company runs under this Software. The software is Unique and user friendly, providing accurate & valuable data to its users across all departments. Gatisofttech gives MIS with a click of a button & helps me to take important business decision. It has really made my life very easy. I would definitely recommend this software. Our experience with Gatisofttech has been always satisfactory. They have assured us their support at any time & day. We sincerely thank Gatisofttech and their team for making our life smooth. Your company is the definition of what a software company should be. We always brag about your software & services to everyone. You and your team has always been above other software suppliers in terms of the quality of the product, support & in-depth knowledge of your support staff. Their software has flexibility in the processes & the controls, which suits the jewellery manufacturing & many other support functions. Gatisoftech have best interests for us in their mind. Every time, they have resolved our problems instantly. They have good transparency in their work. Always delivering more than their commitments. They are more than willing to fulfil our special requests in a very adequate time period. We have tried many famous softwares of our industry before but they failed to meet our demands. Then we were referred to Gatisofttech. They met all our requirements like being user friendly, process friendly with on-the-spot solutions and qualified team. We at Manoj Ornaments Pvt. Ltd. highly recommend Gatisofttech to any businesses who are looking forward to increase their in-house productivity. We are extremely pleased with the software and more importantly the people helping us implement the software. All the modifications and add ons we have asked for have been addressed promptly and with a smile. I would definitely recommend everyone to use this platform. Gatisofttech once again proves that small companies are nimble and adapt faster than their competitors. Gatisofttech is Professional, Courteous, Competitively priced, prompt & talented. Thanks for the excellent work. Gatisofttech actually brought to life a unique vision for our growing company. Gatisofttech takes pride in their work. They never compromise on quality of Software. It was great learning experience to work with them. We recently started diamond jewellery with new brand identity and for that we require more detail data for brand. We found GATISOFTTECH more detailed and user friendly ERP with fantastic layout. The team are very well trained for give 24/7 support. Jewellery industry is required to maintain COMPLICATE account data for real insight of Bussiness, and I guess the core point is very well manage in Smart Jewel ERP. Gatisofttech is an Excellent company. They are extremely creative with a great visuals & technical Sensibility. In an era when a truly skilled technologist are rarely found ‘under the same hood’, Gatisofttech is the exception. Gatisofttech is Outstanding Software Company. I would recommend SJE to everyone in the Jewellery Business. Our Business became more smoother after using SJE. We would like to sincerely thank you for all your time and support. We really appreciate the sincerity and spontaneous response to all our needs. Smart Jewel ERP is a Unique Software which makes us to feel entirety for our business needs... Moreover with a unrivaled customer support. It is pleasure to work with Gatisofttech. Extraordinary services, Helping us with lots of time & dedication to get the best solution that we are looking for. There are thousands of companies who will promise you the world and a company who really do what they say. Promises are FREE and EASY, FOLLOW UP and TO FULL FILL them determines a stellar company to work with. I have given Gatisoftech all my vital projects and they have come through with flying colors, a company I can trust and rely on. Gatisofttech is extremely responsive and gave useful suggestion for solutions based on what we were looking for. Our satisfaction is the ultimate reward for your work. that is why we strive to be your honest customer.